I love legwarmers on little people. Not only are they wonderful for bare legs, they make good impromptu sleeves too. And once you make your first pair out of ladies (or kids) knee socks, you're hooked! I've made pair of spidery legwarmers to give away. One size fits most children. To enter, simply say "Boo" below or something. Giveaway open to anyone, anywhere. I will choose a winner on Tuesday October 11th. BOO! Looks like I'm the first to comment. Hope I win, LOVE your blog!!!! BOO! cute! I love leg warmers but haven't made any yet this fall! Boo! These are too cute! BOO! :D So cute!!! I'd love to win them for my 3 year old! So cute! I'd love to learn to make these! I love them. What a great idea. Boo - the legwarmers are sweet! thanks for the giveaway. My granddaughter would love These! So cute! So cute! I have a 3 year old obsessed with skirts and dresses who would put them to good use. BOO! BOO! BOO! I have 2 pairs of little legs that can alternate these adorable spiders! LOVE THEM!!! So Cute!!! My little girl would love these! 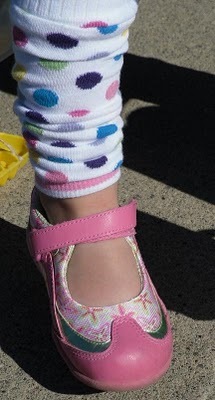 My little grand daughter would look cute in these! so cute! So funny, I just made my first pair for the little one and was downloading the pics for it when I saw your post...HA! They look great! I love how the cuff turned out with the spider web. Boo Hoo! I have 4 granddaughters, they will have to share. Thanks so much for the giveaway. Boo! These would be so cute on my 8-month-old! Boo! I just found your blog and I think its great! !